Nananananananana – you know the rest! Batman has shown up to Comic-Con every year for my critter drops since I first started making these little guys back in 2011, but I’d always modeled him from the animated series. This time I went with classic Batman. There’s so much more color! And fun campiness! And all of the crazy onomatopoeias that would blare up on the TV screen whenever there was a fight. BAM! POW! One that always confused me was “BIFF!” Not sure what kind of fight would produce the sound “BIFF!”, but it sounds kind of fun. I don’t know about you guys, but it wasn’t until I was making this little guy that I realized that Penguin historically has nothing to do with actual penguins, with the exception of Tim Burton’s Penguin. (let me know if there are others!) He’s just a kooky dude in a tux who quacks and has an arsenal of weaponized umbrellas. Huh. You’re looking dapper as ever with your monocle, Mr. Cobblepot. My first two critters for San Diego Comic-Con 2017, ready to go! You know the drill, if you find them at Comic-Con they’re yours to keep! If you’ve got your badges from return registration, congratulations! If you’ll be fighting the good fight during open registration this weekend, may the odds be ever in your favor. The two most popular guesses were Suicide Squad Harley Quinn and Negan from The Walking Dead. For those who guessed Harley, you could say you all hit a home run! I LOVE Harley’s new look in Suicide Squad. 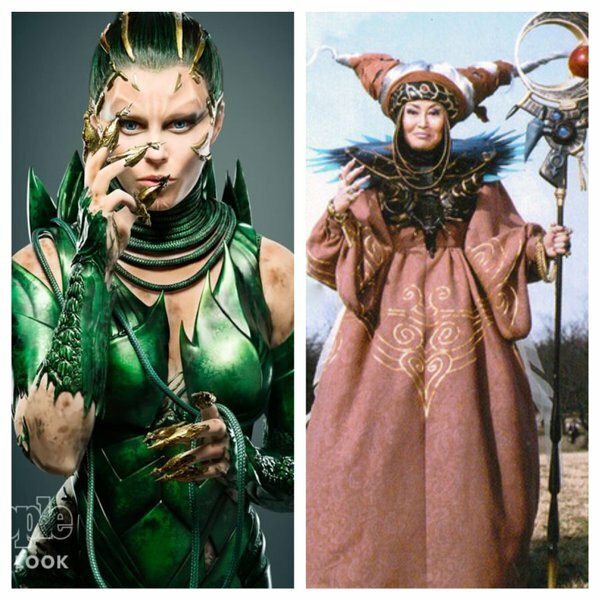 It’s fun, flirty, and still distinctively Harley (counter example: Rita Repulsa in the new Power Rangers reboot who has ZERO resemblance to the original). I made two of these little Harleys so I could keep one for myself because I knew I was going to want to hang on to one. I may have gotten a little ambitious on this, painting little baseball bats with a toothpick, fraying out her hair to give just the right disheveled look…here’s to ensuring that someone will give her a good home out at San Diego Comic-Con next week! I’m just hoping the movie won’t end up anything like the trainwreck that was Batman vs. Superman: Dawn of Justice. They used Bohemian Rhapsody in the Suicide Squad trailer, so at least that makes me happy. Find little Harley at San Diego Comic-Con and she’s yours! Hey, I thought we passed a no-smoking ordinance here in Gotham?? I guess I’ll be fighting crime AND fear-cancer. The struggle is real, folks. Two more critters ready to go for SDCC! 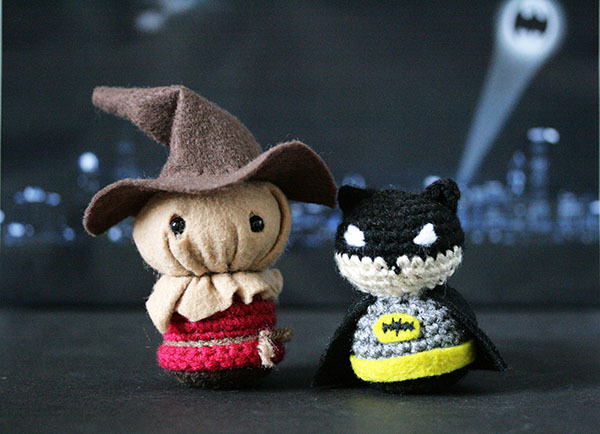 Batman is now a 5-time veteran of being dropped off at Comic-Con, and Scarecrow will be having his first year with all the fun! I’ve been busy lately, and unfortunately the crocheting has been on the backburner for the last month or two. There’s only a month left until SDCC (PANIC!!! 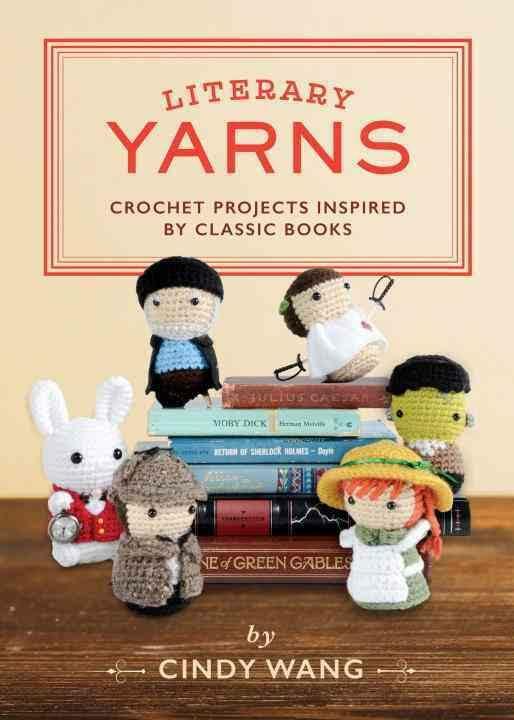 ), but I’m going to try to crochet like CRAZY to crank out as many as I can for adoption this year! I won’t be able to make as many as I have in the past, but worry not my friends, the hunt is still on! Stay tuned and more critters will be coming, even if it’s just a few more!